How to Deal with Risk Factors While Investing in Mutual Funds? If risk management is a matter of concern for you, then this blog will help you in understanding how you can make better mutual fund investments while dealing with variable risk factors. You might have heard of the instances that somebody invested a huge capital in the equity stocks and lost the entire amount due to the market downturn. And there might have been a case when one of your friends opted for corporate deposits, and the company faltered on payments. These events take place as people don’t have enough time to diligently assess the investments instruments prior to investing. But making an investment in this way is simply a wrong move. Here our experts have explained how you can counter the risk factors in your mutual fund investments in a well-planned manner. The risk is defined as the occurrence of an uncertain event. In terms of investments, the risk is defined as the chances that the actual returns on investments differ from the expected or projected returns. This can be explained in a way that, the risk involved in mutual fund investments are divided into two forms. One is related to the fear of losing money; wherein there are chances of losing the entire amount being invested to achieve the financial goals. On the flip side, the other fear is related to the market volatility which tends to reduce the earnings or returns on investments. To get an elaborative understanding about the same, you must get an insight of the entire concept here. You must have understood the basic concept of this type of risk. It is a probability of getting negative returns on the investments. Our experts have analysed the market trends for a continuous period of 10 years for an investment. On analysing the past performance, they have come up with the results that the probability of losing money or negative return, in the beginning, can be very high as shown above in the year 2008. Accordingly, the chances of negative returns or losing money are higher in the short-term period of investment cycle which are for three years or less than that. On the other hand, in the longer tenure, it has been administered that the returns get stabilised and chances of losing high-value get reduced. Solution - To make a smart move on investments and overcoming the fear of losing money due to negative returns, the investors must invest for a long-term horizon. With this, at the time of maturity, the probability of getting negative returns is reduced to a great extent. Investing in equity funds for a short-term tenure with higher risk is not beneficial, it is simply gambling on equities which result is heavy losses. High Volatility, wherein the chances of negative and positive trends are higher. This means that when the market performs better, the returns are increased at a higher rate, while at the time of market downturn the returns get reduced with a greater deduction. Low Volatility, wherein the fluctuations in the returns is either equal or lower rate. This means that the returns are reduced at a low rate in the case of the market downturn, and increased at a less rate when the market moves up. 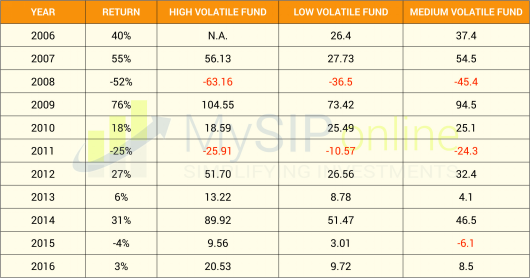 By analysing the table above it can be analysed that the high volatile funds are fluctuated at a higher rate as compared to the less volatile funds during the positive and negative market trends. Accordingly, we can conclude here that though high-risk funds provide negative returns at a greater rate, their positive returns in the growing market are considerable. Solution - This type of risk is managed on the basis of selection of funds after considering the individual risk-tolerance capacity. The investors who have a longer investment tenure and can bear highly-volatile market should invest in the aggressive equity funds, while the others should make the selection of those funds which have moderate or lower risk. Thus, the research and analysis team of MySIPonline has well explained the entire risk management concept for making an investment in the best mutual funds. If you further need any assistance for your portfolio, then you must hire our free financial advisory services now. * Data mentioned in the table is as per NIFTY performance.